By Scott Gilfoid: David Price’s 5th round knockout loss to Tony Thompson (38-3, 26 KO’s) last Saturday night seems to have planted some ideas into the head of British heavyweight Tyson Fury, because he’s now mouthing off about wanting to his cousin Hughie Fury (6-0, 4 KO’s) to face Price (15-2, 13 KO’s) in September. Oh man, this is really reaching on Fury’s part. I mean, I know Price looked bad in gassing out against Thompson, but he didn’t look that bad to where a guy like Hughie could beat him. That would be a big mistake if Fury steered Hughie into a fight with Price, because I think Price would wreck his world by knocking 18-year-old out easily. Even with Price’s stamina problems that he had last Saturday, I don’t see there being a 4th or 5th rounds if he were to face Hughie. Price would get Hughie out of there quickly with a few solid shots to the head. We saw in Hughie’s last fight against Tomas Mrazek (7-41-6, 5 KO’s) on June 15th that Hughie isn’t even ready for a 2nd tier fighter. Mrazek came into the fight with a whole mess of losses on his resume, yet Hughie couldn’t do anything with the guy and he was getting royally tagged by Mrazek all throughout the fight. Hughie eventually got the win by a 6 round decision, but it wasn’t the kind of performance that suggests that he’d do well against a fighter like Price. That’s a whole different story altogether. I’m not a big Price fan, but I’ve seen enough of his fights to know that take care of Hughie in a round or 2 even with Hughie fighting a safety first fight. 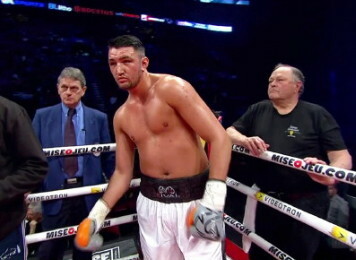 I think Hughie might be a decent bottom fringe contender someday years from now, but that’s about all I can see him doing. It would be insane to have Hughie face Price right now because it would be worse than a slaughter and it might mess up Hughie’s confidence before he even gets his career started.